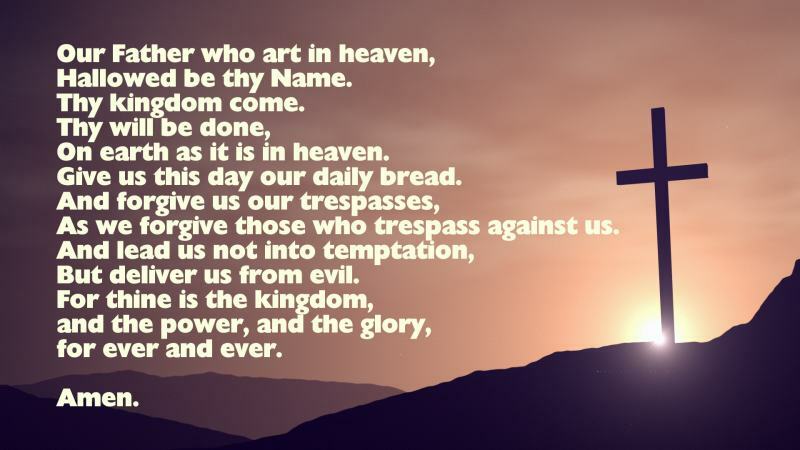 Click here for the version "Our Father who art in heaven"
The Lord's Prayer is one of the best loved and most spoken prayers on the planet. At easter sunday 2007, it is thought that over 2 billion people worldwide recited this prayer. It is used in church services, schools, in small groups and in many individual private times with God. There are numerous different versions of the prayer. The traditional Lords Prayer is based on the Authorised Version of the scriptures in 1611. Other versions in common use are from the New English Version (adopted by the Church of England in 1977), and the Catholic version of the "Our Father" (in latin here ). The Lord's prayer differs in length - the Catholic Church omits the doxology at the end ("For thine is the kingdom, the power, etc). All these popular versions base the text on Matthew 6:9-11, rather than as it appears in Luke 11:2-4. A short line-by-line analysis. Click on the title links for more in-depth commentary. The first of seven requests in this prayer. "Hallowed" means holy. As we pray this line we are reminding ourselves that God is separate from us, completely pure and faultless. Here we become aware of our own frailty as we adore and worship the living God. The third request in this prayer is that God's will occurs. Here we are aligning our will with God's will, we are submitting ourselves to Him, and asking that His way triumphs. Different versions of this prayer use different words here - sometimes "trespasses", "debts" or "sins" (click here for a explanation of this). Here we bring to mind the ways in which we have failed God and others, and ask the Lord for His forgiveness. As we receive God's forgiveness, we bring to mind anyone who we feel may have wronged us, and pardon them. The sixth request in the Lord's prayer is not to be in a place where temptation might overwhelm us. It is not wrong to be tempted or tested (Jesus was!). It is wrong to give in to this temptation. The final request is for protection by our Father in heaven. When Jesus was tempted by Satan, he declared 'Man shall not live on bread alone, but on every word that comes from the mouth of God. '(Math 4:4 NIV). In times of trial, Jesus recognises the Lord as His source of deliverance. Likewise we are to depend on God when evil is at our door. • For thine is the kingdom, the power and the glory. Forever and ever. Amen. The prayer finishes with a closing doxology, that is, a hymn of praise to God. Not all versions of the Lord's prayer include this as many biblical scholars believe that this was added at a later date. The context for the prayer is the Sermon on the Mount, and Jesus discussing how we should pray. We are not to pray to impress God or others, or to think that we might be able to manipulate Him in order to get what we want. (Matthew 6:5-7, The Message) Rather, we are to come simply, as a child would to his father, and honestly, being real about our failures and need of God. Some christians see the prayer as a model for how we should pray, rather than a definitive set of words that we should recite. This view is especially common in modern day evangelical and charismatic churches, where there is an emphasis on praying spontaneously from the heart. However, in other church traditions, such as the anglican and orthodox church, daily ritual in prayer is seen to be important in keeping close to God. There is also seen to be benefit from praying the same words together, as this helps unity of heart in worship. A beautiful prayer made famous by the work of Alcoholics Anonymous. A short film with inspiring images of distant constellations and uplifting music. Click here to read or print the words out. What's the difference between trespasses, debts and sins? If we compare the original version of the Lord's Prayer (found in Matthew's Gospel) with the traditional version (seen above) the main difference between these versions is over the word "debts" or "trespasses". It is also worth noting that the modern Lord's Prayer (New English Version) translates this word as "sins" (Luke's Gospel also has "sins" not "debts"). • Debts: The use of the words "debts" and "debtors" as found in Matthew 6:12 does not necessarily refer to financial debt. In Romans 13:8 we read "Let no debt remain outstanding, except the continuing debt to love one another..." - the word "debt" here being the verbal form of the same Greek word in the version of the Lord's Prayer found in Matthew. • Sin: To "sin" is a general wrongdoing, the biblical definition being to "miss the mark": the target being the perfection established by God and found in Christ. • Trespasses: To "Trespass" is a specific type of sin, normally understood to mean the failure to act for the good and do the right thing. These differences in wording may be accounted for by the original version of the prayer in Aramaic (the spoken language of first century Palestine). In Aramaic, both sin and debt use the same word. Hence this section of the Lord's prayer is a request to God for forgiveness of sin, and not a plea for the pardoning of financial debt. The notion of asking God for forgiveness of sin is common in the Jewish tradition (such as in the Amidah, a prayer said by Jews three times a day) and the Jews of the day would have understood the type of forgiveness that Jesus was referring to. Explore the Lord's prayer in more detail in our in-depth commentary section. 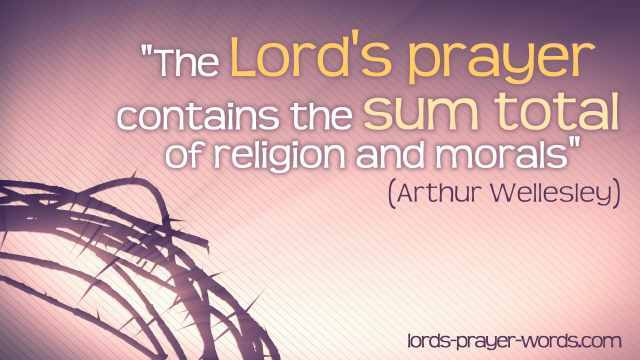 Where does the Lord's Prayer come from? The text in the traditional Lord's Prayer is based on the King James Bible, Matthew chapter 6, verses 9 to 11. As such it is in 'Early Modern English', a period of the English language dating from approximately 1470 to 1650 AD. Examples in literature of the early modern period are the works of Shakespeare, and the publication of the first English Dictionary in 1604 (Robert Cawdrey's 'Table Alphabeticall'). attributed to Reinhold Neibuhr, this profoundly simple threefold request to the Lord is one of the most popular modern day prayers around. "make me an instrument of your peace" is a prayer to be a bringer of change - to transform hatred to love, doubt to faith and sadness to joy. a collection of short prayers to inspire you as you rise! Are you faced with a challenging life situation? Here are several prayers that may help when needing God's strength, courage, healing and comfort. a prayer of King David, psalm 23 is a beautifully poetic reminder of God's love, guidance and protection.